Summer heats up in the pool! 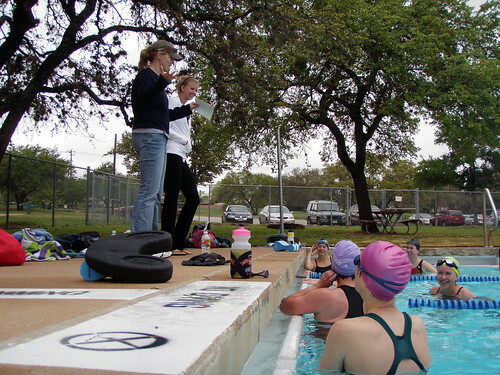 Reminder that the Women First Summer swim program will start tomorrow Saturday June 19 at 8:30 am at Balcones Neighborhood Pool at 12012 Amherst Dr in Northwest Austin. For those new, it is a heated pool with full showers and change rooms available. Please arrive 10-15 minutes early for the start of a new class and new introductions. Coach Sara and Coach Michelle will be on deck excited to see everyone, and hear Danskin success stories. Coach Sarah and Coach Huddie will also be assisting in future classes throughout July and Aug. Sessions are only cancelled in the event of lightning, thunder or temps below zero. If there are last minute cancellations or changes of pools, Sara and I will do our best to contact you by email and/or phone. As in the past, we’ll offer a FREE FUTURE CLASS to the mermaid with 100% attendance. Sandy Morris and Sarah Pruiett were our tied spring winners. Women First Swimming always likes to shine the spotlight on deserving mermaids from the program. We’ve spotlighted many dedicated and hard working mermaids in the past like Sarah Pruiett, Joyce LaBaw, Lisa Paulson, and Veronica Hernandez (our Spring Mermaid Spotlight). 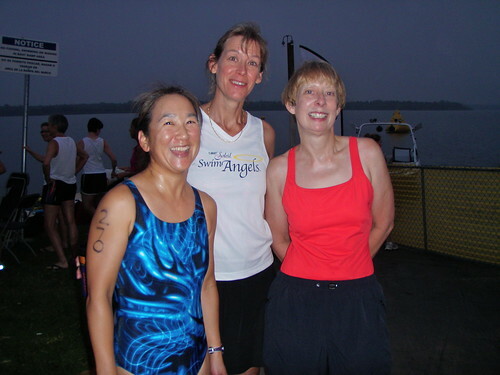 Our Summer Mermaid Spotlight Sharon Behringer was easy for both Coach Sara and Lisa to select for her tremendous improvement and spirited effort to go from the couch to triathlon finisher at the Danskin this year. Not only did Sharon complete her first triathlon successfully, she did it with her daughter/fellow mermaid Alison by her side in the mixed category. We’re glad to have Sharon back for the summer session with Alison and hope she will encourage other mother-daughter teams to TRI! Read Sharon’s full Mermaid Spotlight interview here. There was a 3 way tie with our last winner Joyce Labaw, and Sarah Pruiett and Sandy Morris. Because Joyce won the complimentary class last time, the free class this time will go to…BOTH Sarah and Sandy! Thanks for being such great attenders and supporters over the years! So both Sandy and Sarah will have free summer sessions! No time to waste to get rolling with the Summer Session! We’ll be starting next Saturday June 19 with a 10 week class for the usual 8:30-9:30 am time at Balcones Neighborhood Pool for all 10 sessions. Cost: $125 for full 10 classes. Please make payment by Paypal to row4gold@hotmail.com or mail a check to Sara Robertson, please email for street address. Complete payment details are on the website here. Congrats to all those Mermaids who swam, biked, and ran yesterday at the Danskin Triathlon at Decker Lake. Coach Sara was there as a volunteer swim Angel to support budding and veteran trigirls. She’s posted a bunch of great photos on the Women First Facebook Group. We’re proud of current mermaid finishers below. All the hard work and early Saturday mornings paid off with fantastic finishes by all. Also congrats to past mermaids out there with great finishes: Valerie Allen (1:37.33), Lisa Bonilla (1:49.54), Kathy Carr (2:11.00), Kathy Espinosa (2:05.65), and Amy Fuller (2:40.16). Well done ladies. Big cheers for everyone! Stay tuned for details on summer classes to start soon!